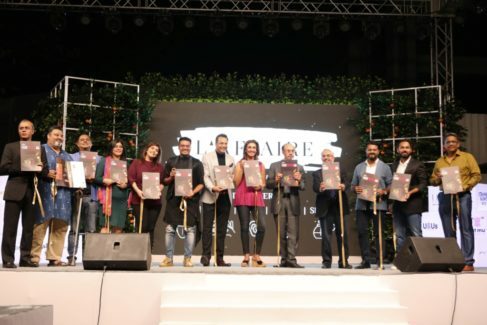 Mumbai, February 5, 2019: Godrej Group unveiled the Food Trends Report – 2019 at their annual brand agnostic lifestyle soiree – L’Affaire 2019 on Saturday, 02 February at The Trees, Vikhroli.Godrej Group chairman Adi Godrej, Godrej Agrovet chairman Nadir Godrej and Executive Director and Chief Brand Officer, Godrej Group Tanya Dubash unveiled the report along with Rushina Munshaw Ghildiyal, Chef Rakhee Vaswani, Chef Varun Inamdar, Chef Saransh Goila, Food Writer and Gourmet Consultant Nikhil Merchant, Food and Travel Author Kalyan Karmakar,Archaeologist and Culinary Anthropologist, Kurush Dalal and Business Head and Executive VP, Godrej Appliances Kamal Nandi. The report highlights significant trends that will impact everyone in the food space. The report not only covers food trends but also focuses on restaurant trends, trends in kitchen designs, beverage and desserts as well. Expect a boom in availability of unusual products with labels like rustic, artisanal, small-batch, crafted, and handmade. Consumers who are pressed for time will rely on concepts such as speed-scratch cooking. This in turn will drive a demand for products that offer the convenience of rustling up personalised meals at home. An increasing number of consumers are expected to pay attention to the functional and medicinal attributes of food products to help them select those that align best with their diet or lifestyle choices. While millets were the focus of attention last year, consumer interest in 2019 will trigger the revival of other traditional grains and indigenous varieties of rice. Gharelu vegetables such as bathua, tendli, lauki, and tinda, which haven’t shown up in commercial kitchens so far, will feature prominently in restaurant menus. As consumers become aware of and appreciate the intricate relationship between food choices and environmental wellbeing, they will actively seek solutions that help minimise impact on themselves and the environment. There will be a rise in the variety of naturally fermented products that are available on shelves and menus in 2019. There will be an explosion of conversations, events, products, and dining experiences inspired by micro-cuisines from specific sub-regions, communities, and even family kitchens. The food industry will create more opportunities to pay homage to mothers, grandmothers and home chefs as the original sources of inspiration, and custodians of our rich culinary diversity. Consumers will get more opportunities to replace their main meals with credible snacking products that align with their priorities around health, convenience and costs.